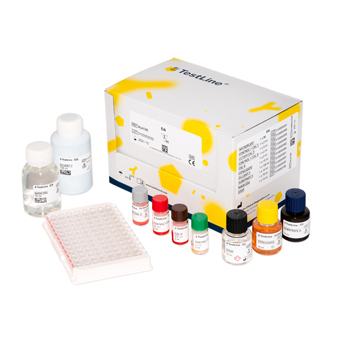 Enzyme immunoassay for the determination of IgG antibodies to dsDNA antigen in human serum or plasma. · Microtitre wells are coated with highly purified native antigen dsDNA. · If present, specific antibodies bind to the antigen. The complex is labelled with Conjugate and detected through a colour reaction with substrate (TMB-Complete). · The kits enables 96 quantitative tests (including controls and calibrators) within the microtitre plate made of colour-coded strips and breakable wells. · Total assay time: approximately 1.5 h.
· Colour reagents for easy pipetting. · Semiquantitative evaluation using the index of positivity (IP) or quantitative evaluation in U/ml units. · Controls, Conjugate and substrate (TMB-Complete) are supplied in working strength. · Test for detection of antibodies to respective ENA antigens. · Differential diagnostics of systemic autoimmune diseases. 1. Dilute tested samples (1:101). 2. Pipette controls, calibrators and diluted samples. 3. Incubate for 30 min at 37 °C. 4. Aspirate and wash the wells 5 times. 6. Incubate for 30 min at 37 °C. 7. Aspirate and wash the wells 5 times. 9. Incubate for 15 min at 37 °C. 10. Add Stopping solution (H2SO4). 11. Read photometrically at 450 nm.